For this Featured Job Friday, we are looking at a job done by Epp Concrete. In Lincoln, Nebraska, Epp Concrete’s foundation repair division completed an installation of 24 helical piers for the Dairy House Renovation project. The property location is 726 L Street in Lincoln, Nebraska, which is the southern side of Lincoln’s popular Haymarket district. This large job was only part of the city’s $15 million redevelopment project. Challenges: Time restrictions and tight working conditions were a problem, especially with limited machinery access. A floor slab was removed and replaced as required to place new columns and footings, which made the project harder and more time consuming than originally thought. 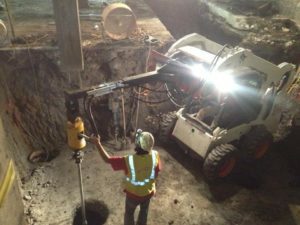 Epp Concrete installed 24 helical piers, and poured back a 4″ mud slab. The employees stayed there there multiple times until 1:00am to stay on schedule. They were obviously dedicated and wanted to get the job done on time and done well. Epp Concrete should be very proud of their work ethic and we applaud them for a job well done. Thanks Dave Epp and team for your continued excellence in what you do. We are lucky to have you as a partner. Check out more work from Epp Concrete at www.eppconcrete.com.